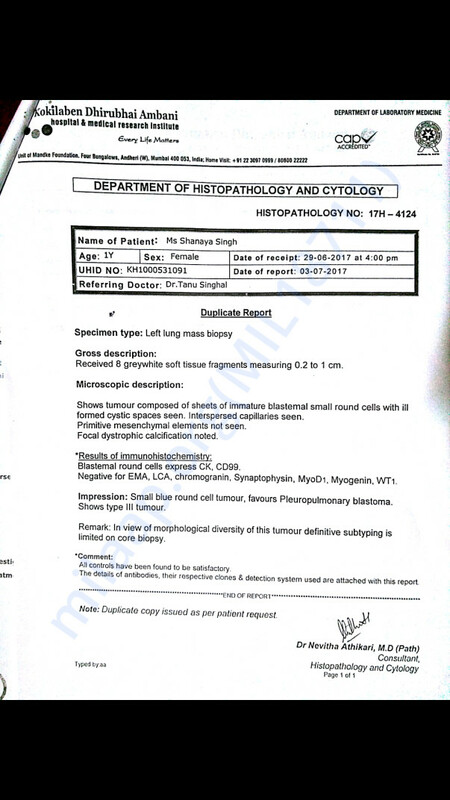 I Ajay Singh, am writing in requesting your financial aid for the medical treatment of my 1year 4 months old daughter Shanaya who has been detected with Pleuropulmonary Blastoma type of(lung) cancer. 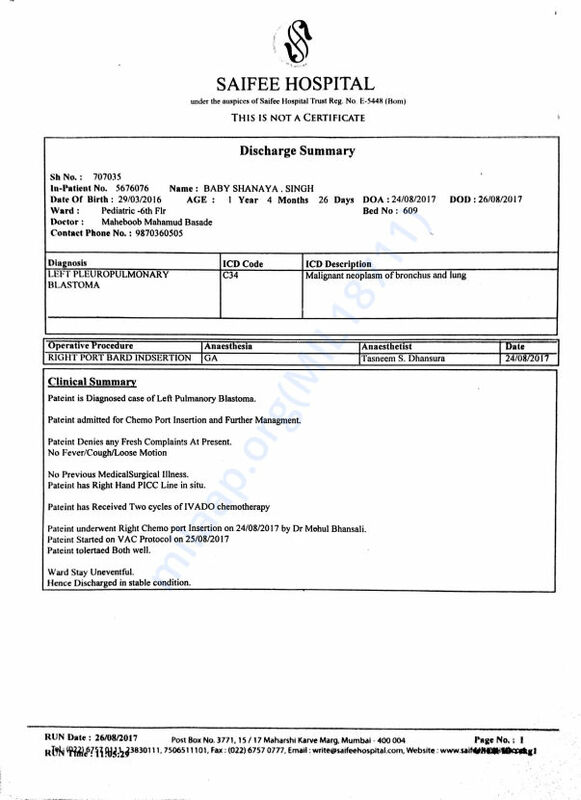 The illness was detected in the month of june and her treatment going on in Kokilaben Dhirubai Ambani Hospital for a period of almost 2 months and during the course of her treatment she also was diagnosed with swine flu. 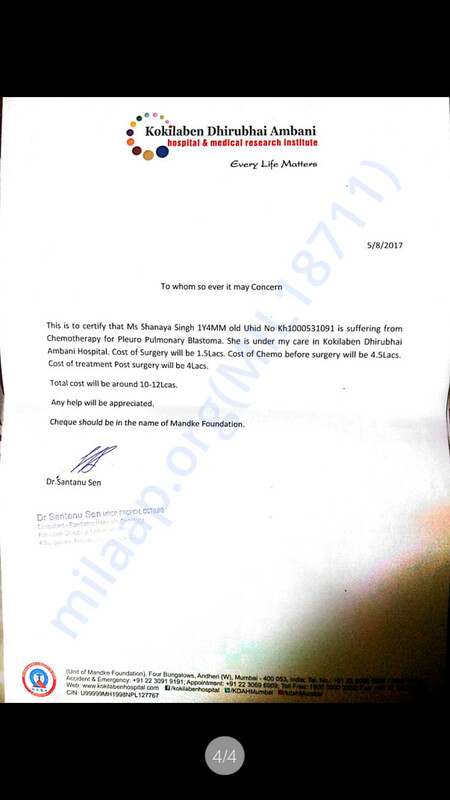 Having already spent Rs700000 for the ongoing treatment, I would further require an amount of Rs 1200000 for operations and chemotherapy. I kindly urge you to look into the matter and provide any kind of assistance as early as possible. Please do contact me for any further information or query on this matter. Thank you so much for your help and prayers. I am moved by your response. 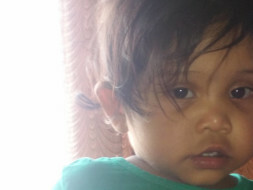 Shanaya's chemotherapy cycle has been over 3 months back and she's doing good now. 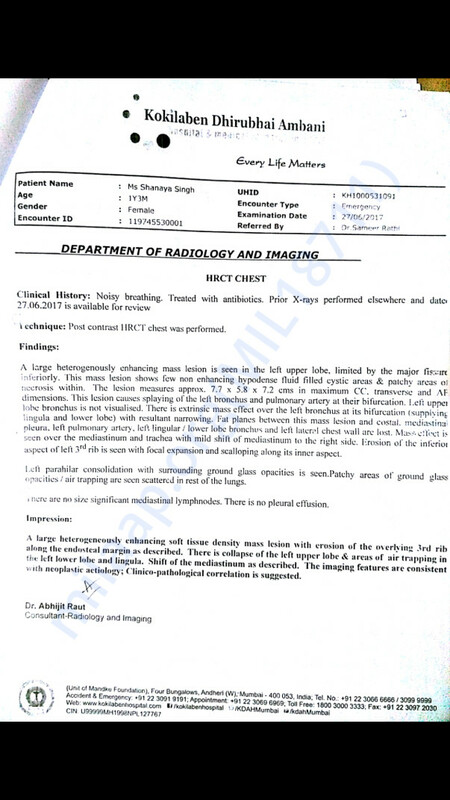 In the month of April, we will be going for PET scan and once the report is out, I will be updating you all. I am sorry for updating late. Thank you so much for your help and prayers. Shanaya was admitted on 26/10/2017 in SRCC hospital and was operated. The surgery was done by Dr. Sajid Qureshi (Tata hospital) on 27/10/2017 for left thoracotomy with excision of the tumor along with the 3rd rib with meshplasty. It was successfully done and she got discharged on 03/11/2017. Her chemotherapy cycle has been started again from November 2017 and this will be continued till for the next 9 months. We will keep you posted. Thank you all once again. Please do pray for her health. Please do share this campaign further with your family and friends. Here is an update on Shanaya. 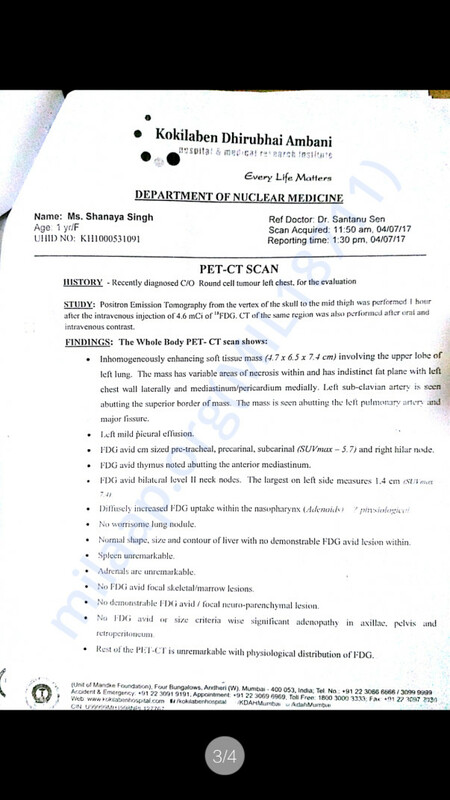 Shanaya has undergone a pet scan on 06/10/2017. She has completed 4 cycles of chemotherapy. 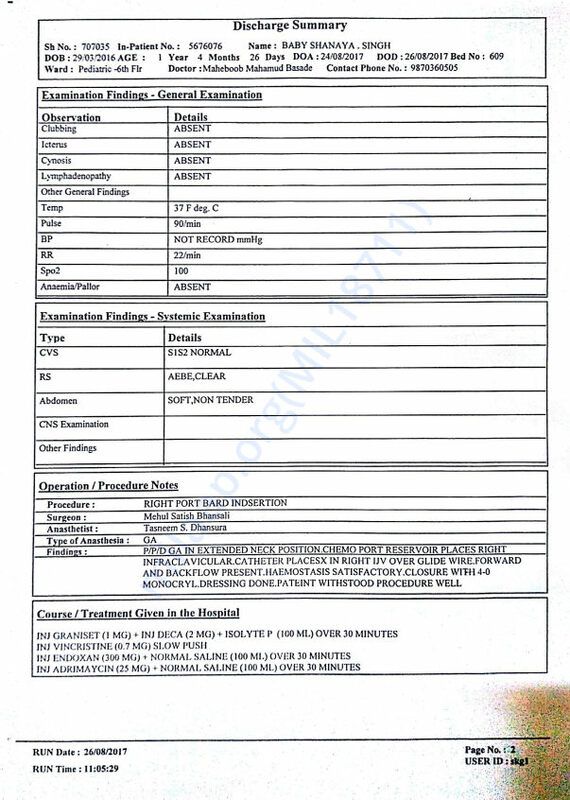 Her next course of treatment would be decided on the basis of the reports of various tests conducted. We will keep you posted. Thank you all once again. Please do pray for her health.